Yeah, know we're supposed to be goin' A-L-L Gaga over the 'Graminator's victory, but I'm more happy for the runner-up instead! Yet I'm quite happy that Graham won the race, as who knows perhaps, just perhaps he can pull off the unthinkable? As the 25yr old Ohioan' now sits firmly in second place, just a tantalizing 9-points adrift of points leader Juan Pablo Montoya! Although Monty' made his statement last year by winning the fastest ever 500-mile race at Pocono which is next up before Sonoma's "Double Point finale, where Rahal looked set to win before his team ran him dry of Ethanol last year while leading. 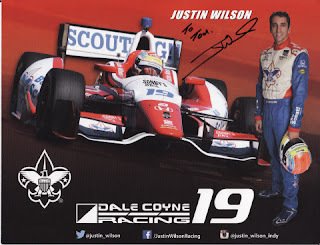 Oh Yeah, but what about My Boy Justin, as the lanky Brit who celebrated his 37th birthday on Friday, July 31st showed the IndyCar field once again how he deserves to be in a fully funded competitive ride, which hopefully he and more importantly his perspective Boss Mikey', nee Michael Andretti can make happen next year! As Wilson was typical class, saying how he knew he didn't want to take out a Honda competitor, so he made Graham work for every inch on the late race restart - but simply couldn't run down Rahal today. Hmm? Perhaps he just solidified his return Fulltime next year; Hopefully! Oh, and what about that Brickyard Moving Truck Driver "Symone," who claimed during the Post-race radio interview the team's now calling him "Michelle" - for which I have NO idea on the inside joke here. As Simon Pagenaud made lemonade outta lemons with his P15 qualifying position to the final step upon the podium, and that's without any AC; Hooah! While my driver of the race has to go to Tristan Turbo' Vautier who brought his lowly Dale Coyne Racing Hondre' home an excellent sixth! So Congrats to Graham, Justin and "Michelle;" Hya! As we'll see how the points shake out after Pocono, Eh! And there's two GURR-REAT Interviews with Mid-Ohio race winner Graham Rahal and a lengthy conversation with the 'Ol Curmudgeon Robin Miller at Speed Freaks, so check out their website.